Help Stamp Out Hunger! Annual Letter Carrier’s Food Drive Is Saturday May 10! Now in its 22nd year, the Food Drive effort is the nation's largest single-day drive. In 2013, 74.4 million pounds of food was collected, which brought the grand total of donations to just under 1.3 billion pounds of food collected over the history of the drive. The Letter Carriers' Food Drive never has been more important. The extreme winter weather and other natural disasters many regions experienced not only exacerbate problems in many communities but also turn some who typically give food into recipients of help. "Many people in this country still go hungry every day," NALC President Fredric Rolando said. "We are honored to be able to help people in need by leading an effort that brings out the best in so many Americans. Six days a week, letter carriers see first-hand the needs in the communities where we work, and we're committed to helping meet those needs." Hunger affects about 49 million people around the country, including millions of children and senior citizens. Pantry shelves filled up through winter-holiday generosity often are bare by late spring. And, with most school meal programs suspended during summer months, millions of children must find alternate sources of nutrition. 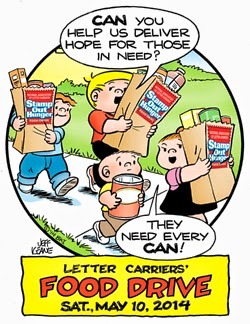 For more information about the annual Letter Carriers’ Food Drive effort in your community, ask your letter carrier, follow the drive at www.twitter.com/StampOutHunger or visit www.nalc.org/food.